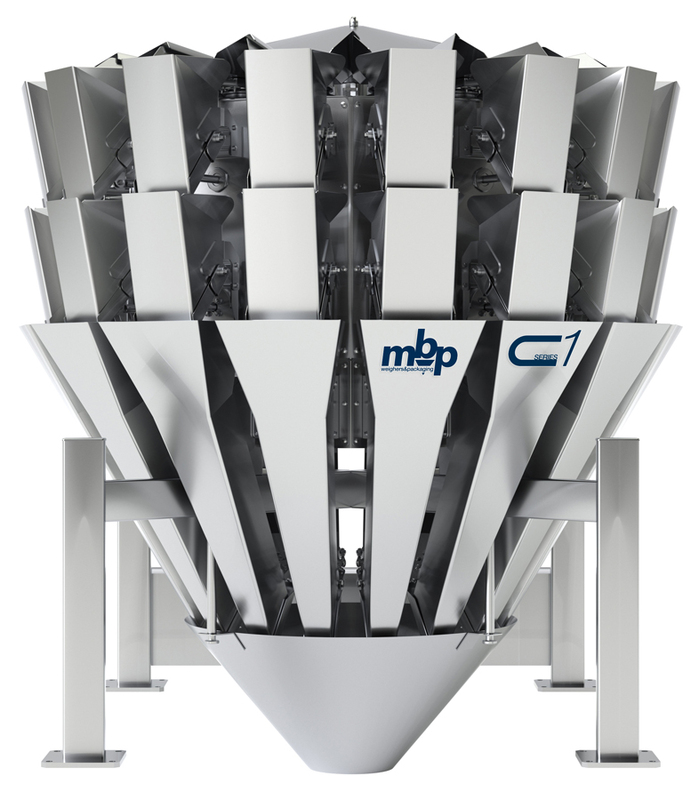 The MBP Series C1 is the entry-level budget combination multi-head weigher featuring an outstanding speed/accuracy ratio achieved thanks to its extremely low “weight regeneration time”. It is 100% made in Italy. On the Series C1, savings, security and productivity have been increased considerably through research and applied technology. Load cell on central base. Easily cleanable smooth structure with no hidden crevices. Vibrating bases with optimum, precise vibration angles. Tubular steel frame with single electronic control panel. Easy to clean and disinfect, fast removal of moving parts. Operated through an industrial PC. CAN-Open type wiring network protected against electromagnetic interference, modular, with fast, high-capacity data transmission. Multimedia software based on Windows, which can be controlled remotely. Parameter setting reduced to just three sets of data. The remaining parameters are entered by means of highly developed automatic real time functions. The Series C1 features a state-of-the-art operating system. It is provided with a Multi-Touch user interface, which enables any page to be accessed in a maximum of two steps. What is truly amazing is how simple it is to program. Thanks to the AVI, ADC and EVA functions the operator simply programs the final weight, the upper and lower limits and weighing speed (wpm). The Home Page contains all the information required to monitor the operating state of the weigher at a glance. The system can also download statistical data in all the conventional formats. The Series C1 uses a powerful embedded, fanless, diskless PC, the latest trend in industrial applications. The powerful processor, which is always upgraded with the latest technical developments, offers the advantage of being able to use highly developed real-time software with state-of-the-art functionality. Either 8.6in or 12in touch screen. The CAN-Open wiring system provides all the security necessary to avoid electromagnetic interference with the digital signal.